The Port of Gdansk Authority SA and Polish rail freight transport operator PKP CARGO SA signed a Memorandum of Cooperation with CFR Marfa, Romanian state rail cargo operator, and the Port of Constanta Authority, informs the port of Gdansk. The document opens a new stage in the development of cooperation between Northern and Southern Europe in terms of logistics services in the railway corridor between the Port of Gdansk and the Port of Constanta. The project is part of the political and economic Three Seas Initiative. It is a joint Polish-Croatian project, launched in 2016 and aimed at strengthening trade, infrastructure, energy and political co-operation among countries bordering the Adriatic, the Baltic and the Black Sea. The project unites 12 countries: Poland, Hungary, Czech Republic, Slovakia, Romania, Bulgaria, Lithuania, Estonia, Latvia, Croatia, Slovenia and Austria. One of the focuses of the project is the development of railway connections within the European transport corridors, in particular between the countries of Central, Eastern and Southern Europe. 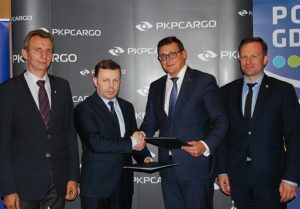 “The agreement is an important step forward, both in the development of the Three Seas Initiative and cooperation between the Port of Gdansk and PKP CARGO. One of the current priorities of the Port of Gdansk is cooperation on the development of railway connections in order to reach our partners and support the Polish economy even more effectively,” said Lukasz Greinke, President of the Board of the Port of Gdansk Authority SA. The logistics services offered are also supposed to constitute an alternative for customers conducting business activity in the regions of East-Central and Southeastern Europe, enabling efficient transport of goods between the Baltic Sea and the Black Sea areas.